I recently came across our ball in maze apk file. I was very eager to make some improvements but unfortunatelly somebody must have deleted my Unity project. So I asked my self how to extract an android game made with Unity to get most of the Unity projectfiles back. Essepecially the .assets files as they took the most time to create. This is also a commonly asked question on the internet. Though I could not find a helpful answer. It’s actually much easier than you’d expect. 😀 In the following article I’ll show you how to do it. It works with any Android game created with Unity. Information: You could theoretically extract the 3d meshes and textures from well known titles like Templerun or Dead Trigger. But ripping games is (as far as I know) illegal, unless it’s your game or you were given the permission to do so. You only want to do it in cases like mine. Quaintproject assumes no liability! First you need to download the 3dsMax script from the website above. To activate or install the scripts it’s enough to simply drag the mzp file into the viewport of 3ds Max. The script is basically a set of scripts, as it includes a plugin to convert convert .pvr files (special kind of images, read about that later) to .dds files etc. You have to start 3ds Max in order to make it work. To have some quick access to the import button click on “Customize”, switch to “Toolbar” and select “Game file import”. Then drag and drop the script to the left toolbar. Next you have to change .apk file ending to .apk.zip the file will still be readable. Dispite that fact a warning might occur. In the next step you have to extract the zipped folder. You can do this be right clicking on the selcted file and choosing “Extract all” (see screenshot). The newly created folder will contain many subfolders, which contain your app’s icon, the Android manifest, a bunch of other files which are not human readable and most importantly the .assets files. Sometimes the assets are split into several parts. The script will then automatically merge all the files into one. Start the importing process clicking on the Unity Importer Button. Choose open folder. Then navigate to the folder Data. Finally hit the open button. The importer script will search the data folder. It displays all the files it was able to find. I’ m mostly interested in the file “Kugellabyrinth” (ball in maze game). Though I choose the option “Import all”. Objects like the camera or the sunlight will be imported as an Empty. We will later get rid of unnecessary objects so there’s no need to click through every single file. It’s a timesaver essepecially when it comes to larger projects. Importing textures worked im my case like a charme. The script will automatically create a folder called “Maps”. Some “.dds files” will be stored within this folder. Dds is an image format. Programms like Blender or Gimp can handle it. For professional mobile games an image format called .pvr is used. This format can store image information at a reasonable quality but with a very small size. This is the reason why this pvr converter is included in the script libary. It works pretty well but I’ve read that .pvr files couldn’t be converted to a different image format for various reasons. If this happens, use texturepacker to load .pvr image and save it to the image format you need. Of course you can keep the image format to rebuild your app. But if your original textures/ spritesheets don’t involve .pvr files this will be irrelevant. 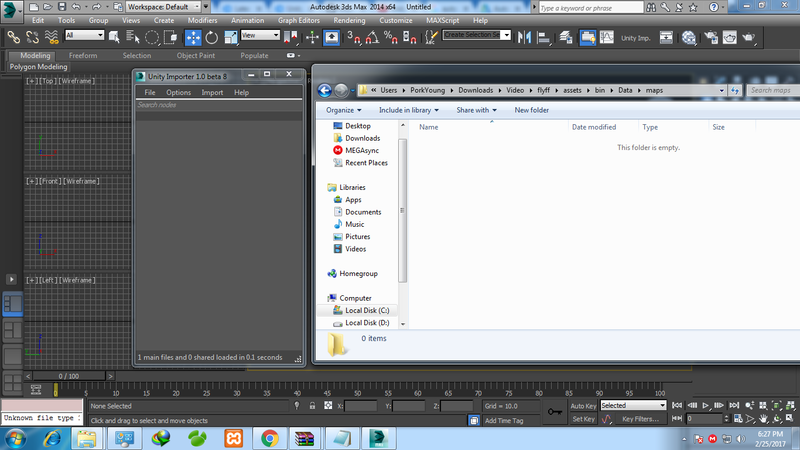 But back to 3ds Max. As you can see my original textures are applied. Another positive aspect of this method is, that the UV’s of my mesh are still available. When using the .3ds importer it can be helpful to get rid of relations, unless they are really needed. Just press Ctrl P and either choose Clear Parent or clear Parent but keep Transformation. Next we want to delete the empties. These are beeing created for example for the sun light, the camera and other objects that basically have no geometry. Search for “Select by type”, select “Empty” and hit “X” to delete them. One optional step would be to clear the scale. Just search for “Clear Scale”. All in all I think that the shown method can really be handy, if it comes to restoring lost mesh files including their textures from your Unity games. It’s also a proper method to make mesh-ups of your games, though your project files have been lost. Of course no shaders are included, nor the scripts. Hi there, I recently got my unity work file removed, it was devastating! but I actually got to export my game file as an exe game before the work files were deleted! So, I hope you could assist me on retrieving what was lost from my game, is it possible to retrieve my scripts and prefabs assigned? Hi there, extracting the assets/ prefabs should work. But I guess you won’t be able to retrieve the scripts. Ask me, if yneed help! Cheers Markus PS click the link for the script to seethe process for a PC game. Argh, those scripts took me a week! But its good to know that I could retrieve the prefabs and assets. this means I get to retrieve the sound and gui graphics too right? I’ll try and let you know of the progress. Sorry I might have missed out on something which link exactly? i have a obb file from a game that I wanted to rip for game porting. I found the .assets file that are parted like this. and so on. how to rip these? the script will try to merge them automatically and delete the splits. Make sure none of the .split# files are open in other programs. You can also merge them yourself before you run the script, using the Windows Command Prompt. i have same problem and has been solved. but how split the file that has been ripped into one file? Somehow my 3dsmax keeps crashing everytime i import the nodes. Thank you for your comment. Did you try importing only a couple of nodes instead of all at once? A good day quaintproject, i would like to have a conversation with you, it`s regarding how to copy button scripts in Unity Android Game. I will provide screenshots of what needed to be done. Is it okay with you? Thank you very much for your time. Please as much as possible, reply asap. Thanks again. I’ve tried several other programs and only one of them was able to extract files as an FBX. Can you help me in to extract 2d split shared unity assets from the games like "blown away first try". Waiting for your reply. We would really like to help you extracting those particular assets. Though, for legal reasons we are not allowed to. Please feel free to reply if you have any further questions. Thanks for replying. “blown away first try” is a 2d game. But your tutorial is for 3d and using 3ds max. I need those hero character and some effects sprites to surprise my sister on her birthday with a small game on her. Can you please tell how to extract those sprites. Waiting for your reply. Please apologise my late reply. Do you know how to extract data like 3d model and texture from “PACKAGE” file? Help required. Thanks in advance. hi, I have a similar problem like Hitokiri, I opened the folder and in the bottom says 29 main files and 0 shared loaded in 0.2 seconds, but the importer is empty, nothing is showing.. what I miss? Hi Bryan, thanks for your comment. Unfortunately I don’t have a valid 3ds Max Installation anymore, but could you please share a screenshot with us? 1 main 0.1 no file loaded . please give me the script ! can anybody please share the importer script? The link in the article doesn’t work. hi, can you help me? I have 3ds Max 2018 but dont have the game file import option in the Customize User Interface menu. Any idea if it was moved in the latest version or how I can still use the script? Thanks for your help ! Can I reverse engineer a unity game from apk? meening decompiling the game from the apk then changing the assets and the package name to republish it to play store? if yes how can I do that thank you! Yes, you can decompile an apk and extract all the assests, but I highly doubt, that you will be able to then compile it to an apk again, without coding. This is unfortunately a one way street.